The Big Strawberry company is owned and operated by Darren and Tarnia Hayes. It is situated at 7034 Goulburn Valley Highway Koonoomoo in Victoria, about eight km from Tocumwal and nine kilometres from Cobram It is a good stone throw from the mighty Murray River, and nestled amongst of one of Australia's prime food production regions. 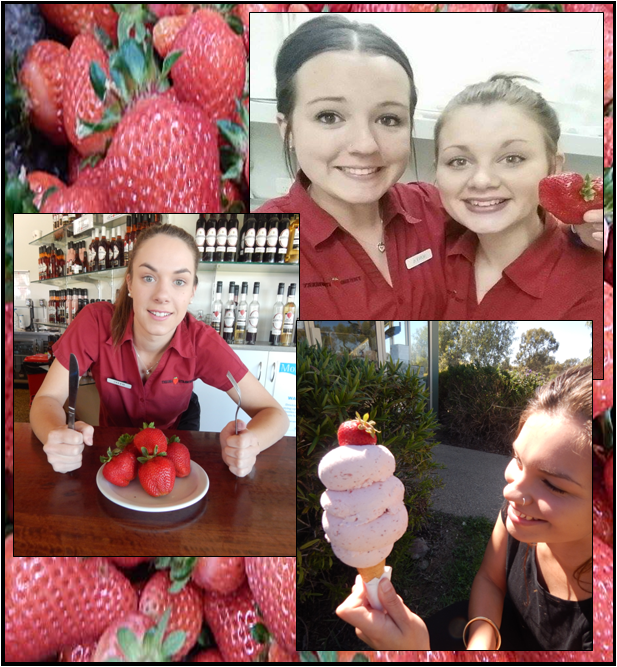 The Big Strawberry building is 1200 square metres and consists of a Licensed Family Restuarant ,a production room with viewing area, a strawberry patch, Giant indoor Playground suitable 0-12 year olds, the newly added History room, Man Cave memorabillia and other collectibles including our strawberry collections. It also has parking for many cars & buses as well as overnight caravan parking. The cafe has seating for 90 people. It displays and sells the many products that the Big Strawberry produce. The large production and storage areas are used to develop and store the many condiments, wines and other products the company make, and for packing strawberries for sale onsite and to local food and fruit outlets. The Big Strawberry farm that supplies the strawberries and other fruit/vegetables is nine hectares with two acres being used for strawberries. It is two kilometres from the Big Strawberry complex. What can you do at the Big Strawberry????????? Dine on our selection of light snacks, meals and strawberry desserts. Play on our Indoor playground with a designated area for 0-3 year olds and a adventure playground for 4-12 year olds. Relax in the family dining area while you supervise your child with our screens and viewing windows. See the Indoor Hive and our "Strawbees"